A magnificent flame mahogany veneered quarter striking bracket/table clock. The large triple fusee movement of 8 day duration with verge escapement, striking the quarters on 8 bells, the hour on a single bell and repeating on demand. Also striking the last hour on a smaller bell at half past the hour. The backplate profusely engraved with scrolls and foliage and secured to the case with matching brass brackets and seatboard screw. The dial features a silvered brass chapter ring, gilt brass spandrels and also with strike/silent facility to the arch. The centre of the dial showing the makers name and place of work, date aperture and typical serpentine pattern hands of the period. The exceptional mahogany veneered bell top case with gilt brass caryatids, ornate side frets, carrying handles and scroll feet. The typical bell top surmounted by 5 gilt brass finials and further applied with gilt brass mounts. A superb and impressive example. 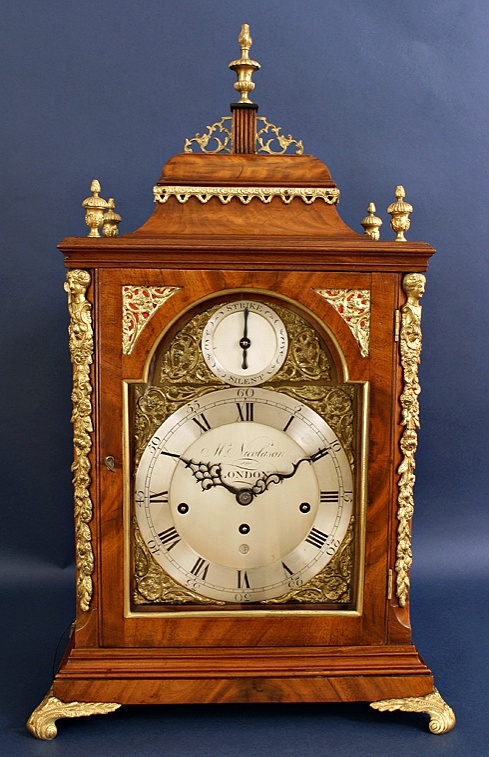 Note: Triple fusee bracket clocks from the 18th century whether they be quarter striking or musical are very rare. They were certainly not made in large numbers due to the complexity of their movements. M. Nicolason is not a listed maker and it may in fact be a retailers name or even the owner of the clock.